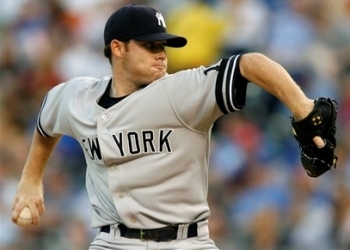 The video clip below is of the pitching mechanics of Ian Kennedy of the New York Yankees. The problem I have with Ian Kennedy's pitching mechanics is that he has a pronounced Inverted L in his arm action. While this doesn't affect Ian Kennedy's timing as clearly as it affects the timing of BJ Ryan, it does still seem to have a negative impact. You can see Ian Kennedy's Inverted L in Frame 40 of the video clip. You can also see that in Frame 44 Ian Kennedy starts pulling back with his Glove Side arm. It's hard to say whether this starts his shoulders rotating or not, but I do see some evidence for premature shoulder rotation in Frame 47. Watch the letters on Ian Kennedy's chest move a couple of frame before Frame 47 and before his Pitching Arm Side (PAS) forearm is vertical. At least Ian Kennedy's PAS elbow is clearly below the level of his shoulders at the point of maximum scapular loading. Given that Ian Kennedy comes from the Tom House school of pitching mechanics and arm action (USC) and is a cohort of Mark Prior and Anthony Reyes, I think he represents a fairly high risk. As a result, I would not be thrilled if the Cardinals traded for him. However, I would be a bit surprised if this trade happens given Ian Kennedy's history as more of a fly ball pitcher.